Fantastic stay at Lavender Circus apartments!! Greeted at 12.45 am with a friendly smile plus lots of handy tips on places for breakfast and to eat out. The apartment was lovely - just as seen on the photos. Great location and able to walk everywhere. Couldn’t have picked a better place to stay on our first trip to Budapest! Loved everything (except the stairs 😊). Sofia a charming hostess, thank you. The Lavender Circus was so beautiful and pleasant. For our first time in Budapest, it was such a magical place to stay. We stayed in the private loft in the very back. We are a bit of a whimsical couple who appreciates art and quirky places. This was it for us! You can also tell how hard the owner worked on every single detail of the space. Everything you could ever need and more...best hostel we've ever been to. I would stongly consider choosing this place for your stay in Budapest. It was one of the best apartments where I have ever stayed. Everything in apartment so cute and cozy, that you just don’t want leave it. In apartment there is everything you need and it has great location. I hope to come back soon. Lovely apartment/double room with private bathroom. Really enjoyed our stay in this quiet, safe hostel! Staff were friendly and communal area was very welcoming and nice for a relaxing cup of tea. Thank you so much! Really enjoyed our stay here. The apartment was huge and had our own kitchen. Security around the hostel was good (almost to the point that we wondered if we should be concerned about something). 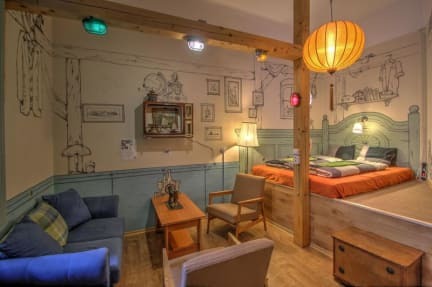 The hostel is completely unique. Very central. Also easy from the airport bus. Not a party place but great place to stay. Lots of steps to room and no lift. Payment is in cash at the hostel. Would highly recommend this hostel. A great place to stay in Budapest. Nice Hostel in a fantastic location. So many great cheap places to eat nearby and very accessible for the metro line. The four flights of stairs to get to the hoste are a bit of a hike but the rooms are nice and clean enough and staff are reserved but friendly. It’s a very quiet relaxed hostel which is great if you’re travelling with a friend or partner. Probably not one to make new friends at.